major win, with a little bit of fail. Last night was indeed great. 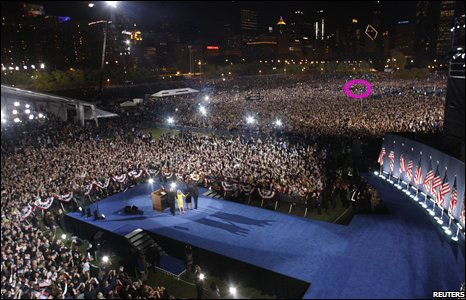 I had my tickets and my guest — along with a couple of great coworkers and their guests — and I was in Grant Park, Hutchinson Field with a large mass of others… The place was packed, crazy, and full of energy. However…. despite all of the win that was last night. (heck, even my old home state turned blue!) … there is some fail too. I just learn that Proposition 8 passed. Not being so much of a political person, nor being in California… I really don’t know what the next step would be. I’ve seen a lot of questions, and a lot of people wondering if this can be overturned. Apparently it only passed by a slim margin… I haven’t actually read a full story about this at all, only just enough to learn what was happening. I heard a little about this last night after the election — news anchors were saying there were three losses for the LGBQT community last night, and Prop 8 was one of those. I’d hate to see this get lost in the shadows of our great joy and victory last night. 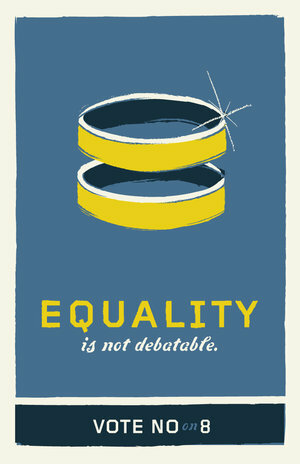 I want the right to marriage, if that’s what I choose, despite what gender my spouce would be. And I’d want that for anyone else too. Hopefully there are some big changes in our future. Posted in musings, seriously. and tragicallyTagged gay marriage, grant park, obama, proposition 8, wincommentLeave a Comment on major win, with a little bit of fail.